If you are roughly my age, and in the mid 80’s had a firearm or firearms, and some Wilderness Trade Craft, you were probably considered to be, or considered yourself, a ‘Survivalist’. By definition, someone who focused on the particulars of preparation for an extreme emergency situation. Then going into the late 80’s, something interesting happened. ‘Survivalist’ began to be synonymous with ‘Gun Nut’, ‘Cultist’ and ‘Militia Member’, and finally, in some extreme cases ‘Terrorist’. This being due to the fact that Terrorist Cells pretty closely mimic a Survival Cell in its methodologies, and utilized similar training evolutions, the difference being one group trains primarily defensively, while the other is obviously offensive (literally and figuratively). By this time, a lot of us decided that discretion being the better part of valor; we were better served by referring to ourselves as the Emergency Prepared. Now, in part due to a rash of survival related reality shows, ‘Survivalist’ has emerged once again as a socially acceptable moniker, with the added benefit of the elimination of some romanticized notions of the past. When the popularized survival movement started during the cold war era, it was easy for some, disenfranchised with the ‘System’ and ‘Big Brother’, to look at survivalism in a darkly romanticized way, which was evidenced by many movies and novels where the protagonists prevailed with knowledge, strength, and superior firepower, in a society no longer constrained by governmental rule. While many did fall for this emotionally enabling apocalyptic vision, I have to say, that while I enjoyed some of these movies as escapist fiction, I didn’t buy into the concept, as there is no real romance in anarchy. First of all, the majority that did were already of the ‘Lone Wolf’ variety. All my adult life, I have had others safety to put before my own interest, and besides, during a Critical Infrastructure Collapse, I am acutely aware of the multitudinous nonromantic aspects. To begin, there is medication and prescriptions I depend on, and while to a degree, this can be compensated for holistically, that is certainly not all prevailing. I also greatly enjoy such things most take for granted. I would be devastated without Chinese Takeout, and Kat and I are Saturday Movie Junkies. In the end, I’m also a realist. The truth is always stranger, and darker, than fiction. Mega-folders – Tactic-cool or Tactic-fool? Actually, it could go either way depending on your expectations and a little research. In the picture, our friend Deb displays two handfuls of Mega Folder, the conundrum? They are conversation pieces only. With that expectation, they are just fine, but with any other expectation, they are downright dangerous. The mega-size Navaja came damn near to cutting off the end of my trigger finger, when, while snapping the last couple of inches of blade open, a rivet popped, turning the lock into a spring, which rebounded the blade back onto my fingers. Luckily, it caught me right across the nail, which the blade bisected. The cut was deep at the finger tip, but only about a 3/16 incision, with comparatively little tissue damage. I was extremely lucky, being particularly fond of that finger. I should have known better, but at the time, I was inexperienced enough to not see the potential failure point. The other knife, the example of the giant multi-blade slip joint, were made mostly as countertop advertising draws for regular size pocket knives in hardware stores. This example is way too big to effectively use blades that size without a lock mechanism. Does that leave us with just Tactic-fool? Absolutely not... 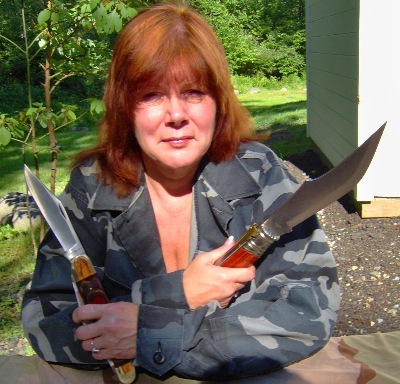 While exploring various locations in the Western Hemisphere, from Desert Isle, to Rain Forest, from Snow covered environs, to urban, I have discovered that it is extremely useful to have a fix blade sized knife, where it was not always politically correct to openly carry a sheath knife. Top Cold Steel Rajah II and Large Espada above my fomer duty EDC Spyderco Waved Delica. We also have a Espada Pocket Sword in the collection that's larger than the Rajah II! It is however, almost too big for any conceivable discreet carry. There were also movies where the watching thereof begged the question; what to do when a situation calls for a big blade, but in a place where the carrying of an open blade would be as much a problem as not having one at all? This is a situation where the Mega-folder comes into its own. A knife the size of a short bladed machete can be carried in a deep pocket or waist pack. Cold Steel has a particular penchant for these monsters, with good opening ergonomics and a great lock system. The Rajah II, and the Large Espada, are but two examples from our collection. They were used to develop a system to counter the the pipe assault beating death of Jodi Foster's on screen Fiance' in 'The Brave One' taking into account realistic NYC Conditions.